From the crumbling ruins of the Inca Empire to the bohemian streets of Lima, past meets present in a land of enchanting contrasts. On this 8-day adventure, we’ll explore the urban sights of Lima, hunting down local huariques for a true taste of culture. Then we’ll head for the highlands, seeking out the secrets of Cusco’s Inca heritage. Embrace the spirit of adventure in the Sacred Valley, gliding over the slopes by mountain-bike. Then prepare for a truly unique bucket-list moment as we seek out the lost city of Machu Picchu. Behold the ghostly remnants of a lost empire, amid the soaring condors and rugged mountains. After returning from the mountains, we’ll delve into the flavours of contemporary Andean cuisine, against the breathtaking backdrop of the sierra. Mountain-lover or culture-vulture, this 8-day whistle-stop adventure will dazzle you. Surrounded by a vast mountainscape, this rustic retreat is nestled in the heart of the Andes and is rich with character. Equipped with a spa and wellness centre, this hotel puts mind, body and spirit at the forefront of hospitality. With a plethora of restaurants and bars at a stone’s throw, this central hotel is well placed for city sightseeing. Boasting spacious rooms and a private bar, restaurant and market place, this is a great place to recharge after your urban wanderings. Flashpackers, welcome to Lima! An airport transfer will be waiting to whisk you off to your hotel – then it’s time for the fun to begin. After meeting your fellow Flashpackers, we’ll head out to the romantic heart of Lima, as we explore the bohemian district of Barranco by foot. From local handicrafts to stylish boutiques, Barranco is laden with the vibrant textures of Peruvian culture. We’ll take a stroll through the streets, passing colonial buildings and lively plazas. As we cross the Bridge of Sighs into Old Lima, absorb the sights and sounds of the city as it lights up for the night. Then, prepare to toast to our upcoming adventures as we hit the bars for a true taste of Lima’s nightlife; get to know your fellow Flashpackers with a Pisco Sour in hand. After filling up on a hotel breakfast, we’ll set off on our urban adventure through Lima’s vibrant downtown. We’ll slowly make our way to a museum in the city centre, which houses a collection of precious pre-Colombian artefacts. Once you’ve marvelled at the artistic heritage of Peru’s past, we’ll tuck into lunch at a downtown restaurant, before exploring Lima’s nature trails and soaking up magnificent views of the city. Then we’re off to the highlands! After touch-down in Cusco, we’ll head straight for the Sacred Valley, just in time for a delicious Andean feast. Then it’s time to unwind to life in the mountains. The evening is yours, so settle into your new surroundings and acclimatise to the high altitude. Feel the fresh air revitalise you, against the stunning panorama of the snow-capped sierra. Today we’ll be hitting the hills of the Sacred Valley in the Andean sierra. Once the heartlands of the Inca Empire, this is a landscape of winding rivers and deep valleys, crumbling ruins and snow-capped mountains – and a truly epic location to discover by mountain bike. Once you’re kitted out with your gear, our first stop is the archaeological site of Moray. One of the most beguiling sights of the Inca Empire, Moray is a large bowl-like compression with circular terraces descending deep into the earth. 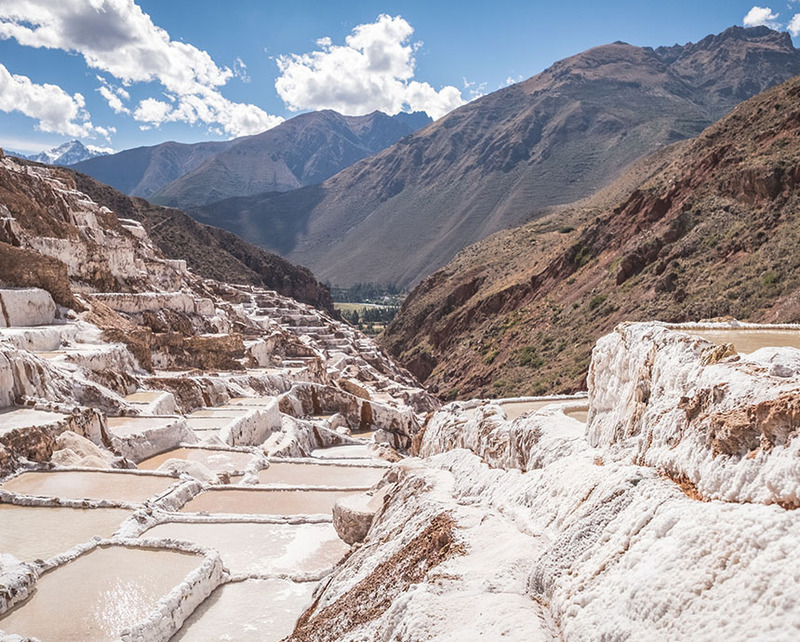 Next up, we’re heading to the Salineras de Maras, a town famed for its striking salt ponds. Prepare to be amazed by this ancient system of cultivating salt since pre-Inca times. After marvelling at the mystery of the Inca Empire, a private bus will be waiting to whisk us back to our hotel. We’ll kick-start today’s activities by taking a train up to Kilometer 104 on the Inca Trail. Then, we’ll follow a hiking trail up the mountain, pausing to explore the ghostly remains of Inca sites. Our first stop: the enigmatic ruins of Chachabamba. These crumbling remains are believed to have been a religious site, as well as a gate house to Machu Picchu. We’ll then make an ascent to a mountain waterfall: soak up majestic views of the Andes as you tuck into your packed lunch. 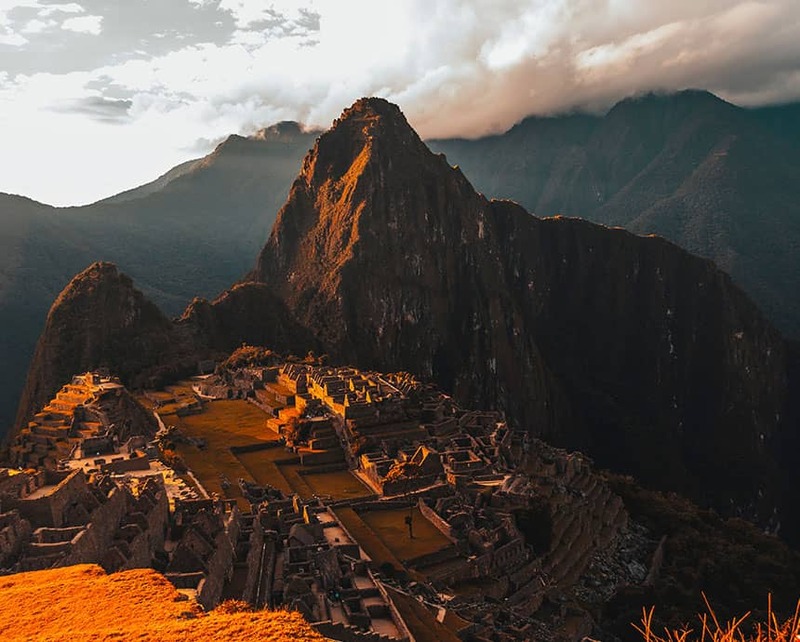 After replenishing our energy, we’ll pick up the pace to the Inti Punku (Sun Gate), where you can enjoy sweeping views of Machu Picchu in its faded glory. Then we’ll hop on a bus to the nearby town of Aguas Calientes, renowned for its medicinal thermal waters. Scattered with restaurants, boutiques and an artisanal craft market, lose yourself in the streets of this little mountain pueblo. Flashpackers, prepare yourselves – today we’ll be experiencing Machu Picchu in its full magic. Located at 2,430 metres above sea level, the lost Inca citadel looks out over the ridges of the Andes Mountains. With crumbling ruins and deep valleys, this is a truly breathtaking backdrop. We’ll be joined by an expert guide, who will be at hand to take us through the chapters of Inca history. Then it’s over to you to explore the fortress at your own leisure. Feel the fresh mountain winds whip around you as you gaze down at the valleys below, with the condors soaring overhead. After lunch, we’ll hop on a train to Ollantaytambo. Take a stroll through the narrow cobblestone streets, marvelling at this fine example of Inca city planning in the shadow of the mountains. After filling up on breakfast, it’s time to hit the streets of Cusco. A UNESCO World Heritage Site, this imperial city was the historic capital of the Inca Empire until the Spanish Conquest in the 16th century. We’ll begin our urban voyage at the Koricancha Temple, an Inca palace built in honour of the Sun God. Journeying through a series of historical landmarks, from the Fortress of Sacsayhuaman to the deeply spiritual Qenqo Temple, we’ll take in the rich cultural traditions of Cusco. The afternoon is yours to do as you please. After an action-packed itinerary filled with hiking and mountain-biking, this is your time to unwind – you’ve earned it! We’ll then gather later in the evening for a twilight stroll, navigating the historical layers of the city as night falls. Foodies, listen up. Today we’ll be delving into the gastronomic traditions of the Andes, as we explore the vibrant possibilities that San Pedro Market has to offer. Feast your eyes on the rich abundance of local produce, from bursting fruit to hard cheeses, and lose yourself in the a maze of beautiful traditional textiles. After learning about the foodie products, turn your hand to transforming them into Peruvian specialities under the guidance of a professional local chef. You’ll also learn how to craft the perfect Pisco Sour – salud! After lunch, the afternoon is yours. Wander through the sepia streets and absorb the epic atmosphere of this highlands city. Or if culture is your thing, explore the city’s galleries and museums at leisure, absorbing Cusco’s vibrant artistic heritage and unique cultural identity. Then we’ll reconvene in the evening for a final farewell feast. We’ll toast to an epic adventure, sharing stories and memories as the sun goes down. Flashpackers, it’s time to say goodbye. After filling up on breakfast, it’s over to you to make your own way home. What a trip it’s been: from the epic bucket-list experience of Machu Picchu to the contemporary flavours of Cusco, we’ve travelled through the legacy of the past, right up to the present. We’ve wandered through the cobbled streets of Old Lima and soared through the Sacred Valley by mountain bike – and made sweet new friendships and precious memories on the way. Not quite done with South America? Check out our mind-blowing trip to Chile. And for those of you heading home: hasta la proxima! Until next time. Fly into Jorge Chávez International Airport, Lima and out of Alejandro Velasco Astete International Airport, Cusco. Please try to arrive by 5pm on Day 1 (although we will pick you up no matter what time you arrive) and feel free to depart anytime on Day 8. If Inca Trail permits are unavailable by the time you book, an alternative activity will be planned.